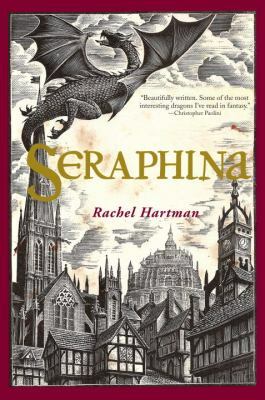 A very unusual teen fantasy novel introduces Seraphina, 16 and very musical, who is assistant to the court music master in the kingdom of Goredd. Seraphina has an enormous secret; her late mother was a dragon and music instructor Orma is her uncle. Seraphina is also plagued by visions of other unusual people, and Orma trains her to organize them in a virtual garden. Dragons are emotionless and fierce, gifted in science and mathematics and can take the shape of a human to interact with them in Goredd, but half-dragons are against their code. Forty years ago, humans and dragons signed a peace treaty, but there now there is unrest. While helping the music master with a state funeral and preparing for the celebration of the treaty, Seraphina draws unwanted attention to herself. She gives harpsichord lessons to Princess Griselda, and is befriended by Griselda’s cousin Kiggs, who is trying to protect the royal family and keep the peace with the dragons. This book is hard to describe, but really caught and held my interest. A sequel, Shadow Scale, is to be published in March.